Clearance Height of 8` 6"
The RNT-LM-HLM65-16X500LTL-LED-TLR from Larson Electronics is a Trailer Mounted Hydraulic LED Megatower® that offers high output illumination and extreme durability in heavy-duty industrial applications. This trailer mounted fold over 7-stage hydraulic light plant provides a safe and effective way for operators to quickly deploy twenty 500-watt LED light heads to elevations above 65` (ground to mast head), reaching a total height of 77` (with 11` of light head assembly). 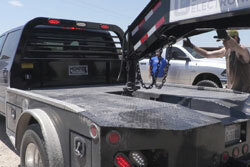 This trailer mounted light tower features a choice of 120/240V or 120/208V single-phase or 240V/120 or 208V/120 three-phase power distribution panel with customer provided connection, depending on preference. This hydraulic light tower folds over for easy transportation, features a hydraulic ram upright assist, hydraulic mast and high output LED fixtures. 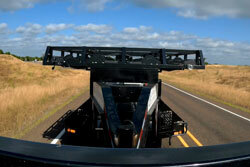 The entire assembly is mounted onto a 33` dual tandem axle goosenecktrailer, allowing operators to transport this fold over boom from location to location. The RNT-LM-HLM65-16X500LTL-LED-TLR has been designed to hold steady through extreme condition and can be easily transported through any kind of rough terrain. 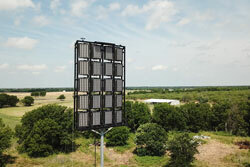 This Megatower is a direct replacement for 1,000W metal halide light plants. 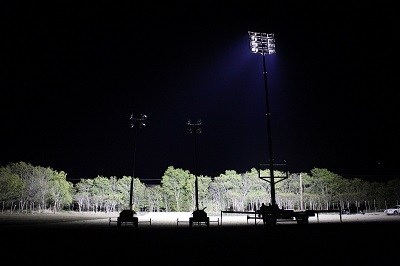 The RNT-LM-HLM65-16X500LTL-LED-TLR is a towable, high-performance light tower package. This unit is equipped with a choice of 120/240V or 120/208V and single or three-phase power distribution panel with a customer provided connection to supply current to twenty, 500-watt LED lights producing 67,500 lumens each, for a combined total of 1,350,000 lumens. A hydraulic telescoping light mast elevates the LED lamps to heights above 65`. 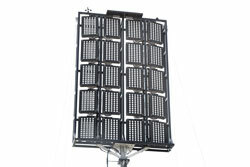 The hydraulic tower is capable of reaching heights up to 77` with the light head assembly, which measures 11` in height. They heavy-duty nature of this Megatower makes it ideal for mining-grade applications, as well as, large scale event illumination, construction, industrial operations, and anywhere a rugged mobile full power lighting system capable of extended operation is needed. 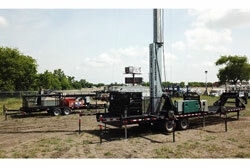 This telescoping seven stage hydraulic light mast from Larson Electronics is designed to allow operators to quickly and safely deploy up to 10,000 watts of high intensity LED lighting in locations where illumination must be elevated to heights above 65` (from ground to mast head; 77` in total height with 11` light head assembly) for effective coverage. This light boom can be collapsed to 30` for applications where a footprint smaller is required. 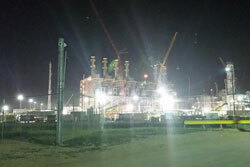 The tower is constructed of carbon steel tubing with 2` foot of overlap per section. 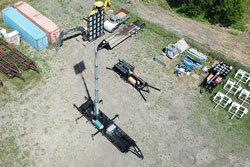 The mast is elevated using an included hydraulic ram and extended to its full height using a second hydraulic system. Lights: The RNT-LM-HLM65-16X500LTL-LED-TLR Hydraulic LED Megatower® from Larson Electronics features twenty GAU-LTL-500W-LED fixtures that each draw 500 watts, for a total fixture wattage of 10,000 watts. 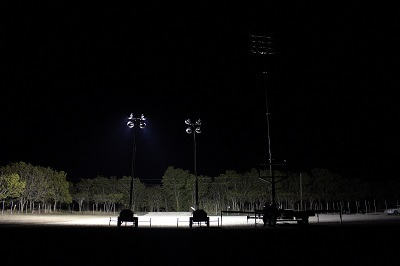 Each module produces 67,500 lumens at a color temperature of 5000K for an impressive lumen total of 1,350,000 lumens which provides operators with a superior lighting solution for even the most challenging areas to illuminate. To ensure even coverage of wide areas, the LED modules used on this hydraulic light plant are configured in Larson Electronics for even distribution pattern. Durability: As well as unparalleled heat control, the LED lights used in the RNT-LM-HLM65-16X500LTL-LED-TLR also offer IP67 rated construction that is designed to withstand extremes of environmental and operating conditions. These units can withstand rapid temperature changes of -40° Celsius to +85° Celsius, are waterproof, and resist ingress of dust, dirt and humidity. We recommend these LED lights for use in applications where a lot of vibration, dust, dirt, dampness and abusive working conditions are encountered. 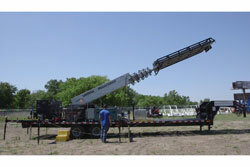 Telescoping Boom: The hydraulic telescoping boom is constructed of carbon steel with a galvanized finish and extends to 65` in height from the ground to the mast head and 77` of total height with the light assembly (measures 11` in height). This boom is raised from and lowered to the folded position by a single hydraulic ram and extended or retracted by a second hydraulic system. Wiring/Controls: The LED light heads are grouped into banks of four. Each bank in wired into the NEMA 3R breaker control box at the base of the mast. Operators control the light heads via an on/off switched breaker per bank of five light heads. The hydraulics are also powered from within this breaker box. The mast elevation is controlled by a push button switch to operate the hydraulic ram allowing operators to raise the mast to the upright position. The vertical deployment is operated by a second push button switch allowing operators to extend it to its full 77` height or retract it to the collapsed height. The above images show a side by side comparison of the light output between our LED light plant and a traditional four lamp metal halide light plant. 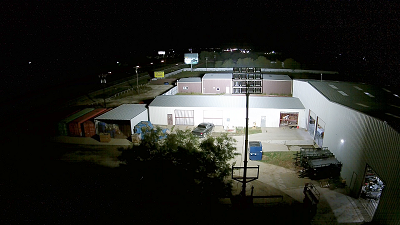 The left image shows the metal halide light plant raised to 30` and illuminating a 50,000 sq ft work area with four 1000 watt metal halide light fixtures. 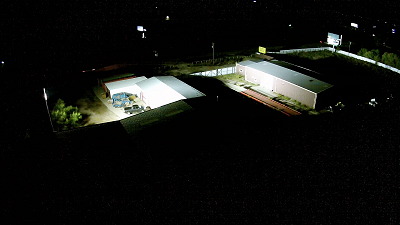 The right image shows the RNT-LM-HLM65-16X500LTL-LED-TLR light plant raised to 50`, illuminating the same 50,000 square foot work area with twenty 500 watt LED fixtures. Notice how the color and intensity of the work area is greatly improved when lit up by the LED fixtures. 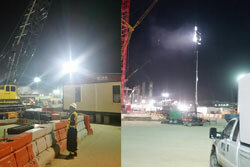 The left image above shows the light mast illuminating a 300,000+ square foot area. The yellow billboard in the image reaches 40 lux, while the fence at the tree line (500`+ away from the tower) reaches 35 lux. 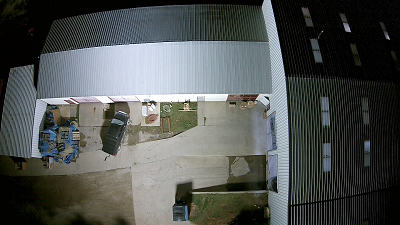 This image was taken from 50` behind the mast and at 100` above ground level. The image to the right shows the work space 75` in front of the mast, with the entire area work area reaching over 100 lux. The mast was extended to 35`. 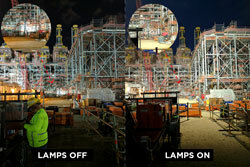 The left image above shows the same 300,000+ square foot area being illuminated. In the background you can see a vehicle with their headlights on, barely able to be seen in comparison to the RNT-LM-HLM65-16X500LTL-LED-TLR light plant. 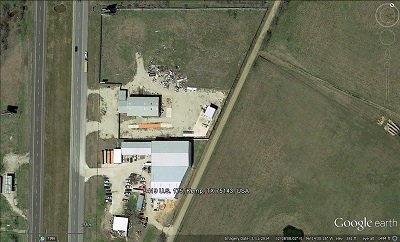 This image was taken at 80` to the right of the mast and 175` above ground level. The mast was extended to 35`. The image on the right is a Google Earth export of the physical area being illuminated, for scale purposes. Cold Weather Package: The RNT-LM-HLM65-16X500LTL-LED-TLR is designed to withstand extreme cold environments and harsh winters. The hydraulic system is equipped with a de-icing system to prevent the hydraulic lines and system from freezing from moisture building within system. This de-icing system uses an environmentally friendly (non-toxic) fluid. All hydraulic lines are equipped with cold weather rated hydraulic hoses rated for -65°C and fitted with metallic hardware. 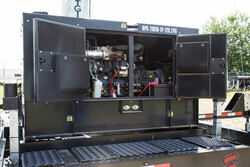 All the hydraulic controls are housed within an insulated and weather tight enclosure. This hydraulic control box features 1/2" thick polystyrene foam insulation and heat trace. Suggested Applications: Mining, Temporary lighting, construction site illumination, outdoor event lighting, job site lighting and other applications that requires a source of illumination capable of covering a very large area effectively.